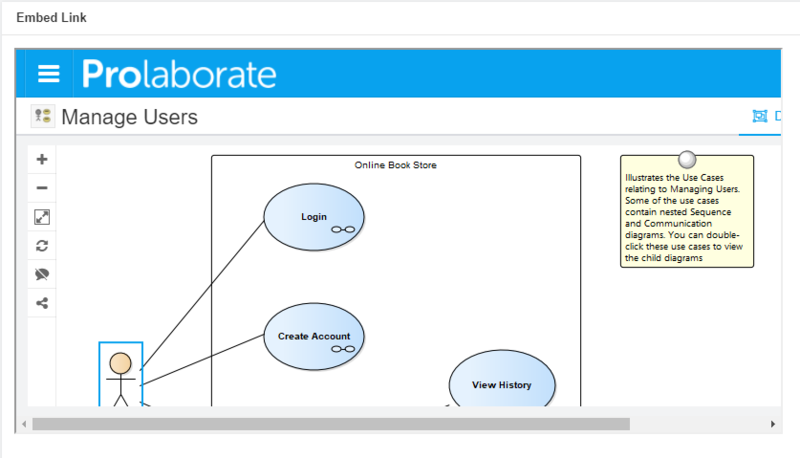 Prolaborate lets you share Enterprise Architect Models, Views, Packages, Diagrams and Elements as links and invite anybody in your organization to quickly get feedback from them on an EA item. When you click on a Package, diagram or an element from the Repository browser, the overview page or the Diagram page will open up. Click on Share > Share this Link. 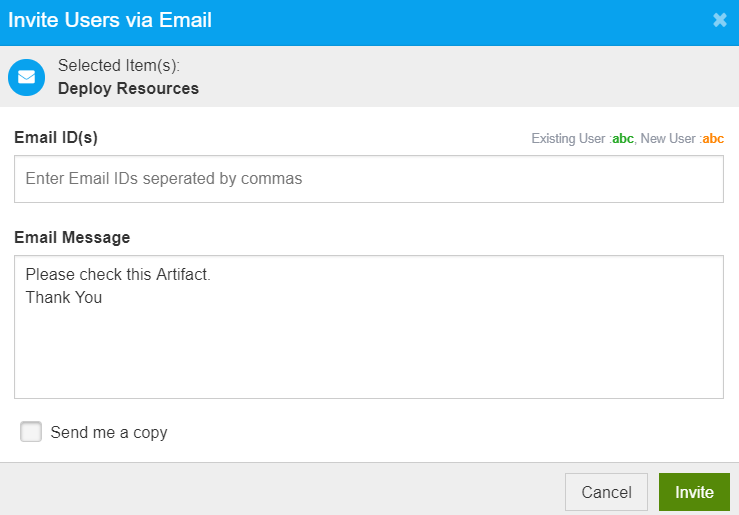 Private Link can be used to share an EA element with Prolaborate users as it needs valid credentials and access permissions to work on it. Anybody with the Public Link can view the EA element. They get a read-only access to all the properties, details and discussions of this EA element. Embed Link can be used to embed the EA element in a Web portal. Now, lets see how these links work. If anybody opens the Public Link, it will show the EA element (Diagram in this case) in read-only mode. The recipients of this link can even click on the elements and view their details. If you have valid credentials, you can click on Anonymous (Top bar) > Login as user and access it as a Prolaborate user. If in case you are already logged in, your user name will show up when you click on Anonymous. If anybody opens the Private Link, they will be directed to the login page of Prolaborate and once they login they will be taken to that element’s page. If you use embed code in a web portal, it will look like below. The web page will be embedded and live contents will be shown in the web frame. Note: This is a widget from Prolaborate Dashboard which lets you add HTML code. Prerequisite: Invite Collaborators setting should be enabled from Mailer Configuration. 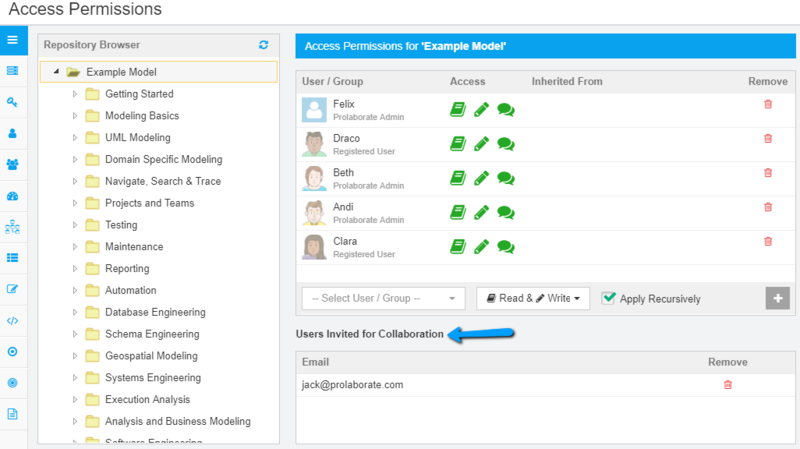 You can use this feature to invite your peers to collaborate on Enterprise Architect models in Prolaborate. This is a quick and hassle-free way to get feedback from your peers as they automatically get Collaborate access once you invite them. You can invite them from the details page as by clicking on Share > Invite Collaborators. You can also customize the invitation message as per your requirements. If you want to receive the copy of the invitation, you can check the Send me a copy option. New and existing email IDs are differentiated using the color codes shown in the screenshot above. You will receive an email if you are invited to collaborate on an EA item. The EA item will open when you click on the link.You will also be shown a Registration window; you can register if you want to become a Prolaborate user. You can readily participate in the discussions and share your feedback. The name on the top right of the page will display your user name if you are a registered user; if you are not yet registered, it will show your email id. To view the list of collaborators on a particular EA item, click on Share > List of Collaborators from the details page. 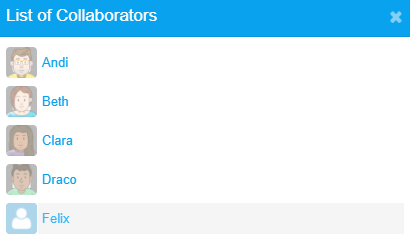 If you want to remove any of the users whom you have invited to collaborate, you can do so from Users > Invited Collaborators page or from Access Permissions page.